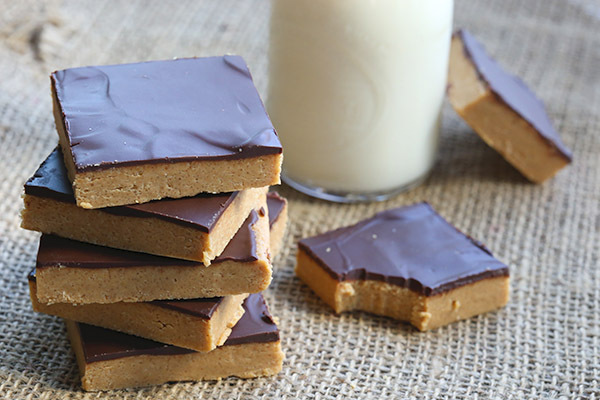 I've made these amazing peanut butter bars a few times now and finally decided to post the recipe. My father-in-law loves them, so I make them for him from time to time. They are just so darn good and so darn easy to make, so I had to share. They're also extremely rich so you don't even need to eat much... unless you want to. ;-) This recipe makes plenty, so you can keep some for yourself and give away the rest. 1. In a medium bowl, mix together the butter or margarine, graham cracker crumbs, confectioners' sugar, and 1 cup peanut butter until well blended. Press evenly into the bottom of an ungreased 9x13 inch pan. 2. In a metal bowl over simmering water, or in the microwave, melt the chocolate chips with the peanut butter, stirring occasionally until smooth. Spread over the prepared crust. Refrigerate for at least one hour before cutting into squares. 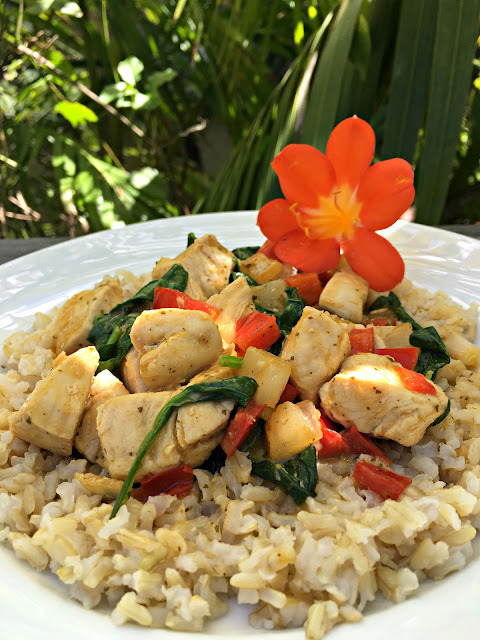 So, here we have a very easy, very delicious recipe for Cashew Chicken with Brown Rice. 1. In a medium bowl, whisk together all of the ingredients for the sauce; set aside. 2. In a large nonstick skillet, heat olive oil over medium-high heat. Add the chicken to the skillet and cook for 5 to 7 minutes. Add the peppers and cook for 5 additional minutes, or until the chicken is cooked through. Add the cashews, greens and sauce and cook for 2 or 3 minutes until the sauce thickens and the greens are wilted. Serve immediately over white or brown rice. 3. Store leftovers in an airtight container for 2-3 days in fridge. Ah, pumpkin season. Probably my favorite season of all. I've already made several batches of pumpkin pancakes in the last month. These are my staple pancakes, but I opted for an easy recipe for one just to try something quick. All you do is add all the ingredients to your blender, blend until smooth, add 3 dollops of batter on your griddle, and you'll have pancakes in about 10 minutes. The oats kept me feeling full and satisfied for several hours and powered me through an intense workout. I'm actually starting a "Six Weeks Challenge" at my local fitness studio. The goal is to workout at least 4 times per week at the studio and record your diet. My personal goal is to work out at least 5 days per week. I really notice a difference in my body and fitness level if I go less than 5 times per week for an extended time. But everyone is different and the key is to do what works for you. I also recommend using the free app Lose It to record your food. It really helps when you hold yourself accountable and see what you're actually eating each day. I have made a lot of progress in the last few weeks by recording my meals. The Six Weeks Challenge is just a more fun, group oriented way to kick start a goal. That's just some lifestyle advice based on my experience, but here's the recipe! Scoop 3 even sized dollops of batter onto a preheated griddle. Cook for 2-3 minutes on one side until golden, then flip and cook an additional 1-2 minutes. Top with pure maple syrup, nut butter, or jam and enjoy! Have you ever tried overnight oats? You can buy them everywhere now, but honestly, it's much cheaper and super easy to make them at home. The base for any recipe is pretty much the same. You add 2 parts of a liquid to 1 part oats. So for example, you would do 1 cup of old fashioned oats to 2 cups almond milk. Some variations are adding in Greek yogurt for a protein packed recipe or applesauce for an apple spice fall recipe. But I'm going to share my basic recipe for overnight oats with my favorite chia jam as a topping. 1. Add all ingredients (start with 2 tablespoons of the honey) to a blender or food processor, and pulse until the it is the texture you prefer. 2. Taste and add more honey if you would like a sweeter jam. 3. Transfer the mixture to a container with a lid (I used a mason jar) and allow to set in the fridge, about an hour or overnight. 1. Add all ingredients to a medium container with a lid and stir to combine. Mixture will look watery, but will thicken up after sitting overnight in the fridge. 2. When ready to eat, stir oats around. Top with chia jam, nut butter, fruit, or toppings of choice. *This recipe is very versatile, so add in whatever extras you'd like... goji berries, cacao powder, protein powder, nuts or seeds of choice. I personally like chia seeds because they help to thicken up the oat mixture and add texture. I apologize for the gap in posts. I was finishing up my first year as a school counselor and the end of the year got a little crazy. Plus, I'm finishing up final wedding details and our social calendar has been going steady almost every weekend for the past couple of months. Don't get me wrong, it's been an exciting time, but I haven't found the time to create new recipes, photograph them, and write posts. I am happy to report that I am now on summer break!! My first ever paid summer off. Such an amazing feeling! And even though my wedding is just a few days before I start back to work again next school year, I still hope to be able to post new recipes more frequently. Today, I am posting my very favorite banana bread! I've made it probably 10 times and I'm surprised I haven't posted it before now. It's the most moist, flavorful banana bread I've ever had. Although I love traditional banana bread with walnuts, this chocolate chip version is out of this world. You could always sub out nuts for chocolate if you want to. You can also use gluten free flour and the recipe is vegan if using milk free chocolate or nuts. As the temperature warms up, bananas seem to ripen quicker on my counter. I had three tired bananas that I was able to use up in this recipe. I also keep a bag of frozen bananas in my freezer. Check out these vegan banana ice cream bites and stay tuned for new ice cream recipes I want to try out this summer with my ice cream maker. 2. Whisk flour, baking soda, salt, and cinnamon in a medium bowl. Add 1/3 cup oil, maple syrup, milk, and vanilla to the dry ingredients. Stir until smooth. 3. Using a rubber spatula, gently fold in the mashed bananas and chocolate chips. 4. Fill the prepared pan(s) halfway with batter. 5. Bake in the center of the oven for 25 minutes if using a mini loaf pan. Larger loaf will take 40-50 minutes. Cook until a toothpick inserted into the middle of the pan comes out clean. 6. Let the bread sit for 20 minutes before removing it from the pan. This is an especially moist bread, so it may not look completely done when you remove it. It firms up as it cools, but center may sink in a bit. I have had the biggest craving for muffins lately. I love pretty much all baked goods in general, but I am especially fond of breakfast pastries. Shopping at Sprouts I always pass the baked goods display and feel tempted... but in California the law makes a lot of food service providers list the calorie content of their products, and alas, 450 calories is just too high for me. But that's a-okay because I found the most delicious healthy muffin recipe that's gluten free, vegan, and has a surprise ingredient. Drum roll please... garbanzo beans! You'll have to trust me that you absolutely cannot taste any "bean" aftertaste whatsoever. Just make sure you rinse and pat dry the beans before you blend them. These muffins are very moist and have a fudgier, more dense consistency than normal muffins. They taste better the next day, so if you can help it, let them rest for 24 hours before consuming. Or don't. They're still good fresh from the oven. This recipe only makes for 8-9 regular sized muffins, so double the recipe if you want more. The chocolate chips are optional--improvise with nuts, chia seeds, or berries if you feel so inclined. Also, only fill the cups about 1/2 full. The muffins won't rise much as there's no flour and filling them to the top can result in the tops sinking in. optional handful mini chocolate chips, crushed walnuts, shredded coconut, pinch cinnamon, etc. 1. Preheat the oven to 350 F and line 8-9 muffin cups. 2. Drain the beans and rinse extremely well, then pat dry. This is important because it gets rid of any bean taste. 3. Blend all ingredients until smooth in a blender or high-quality food processor. 4. Pour into the muffin cups – don’t overfill or they will rise and then sink in the centers. Bake 17-20 minutes. They will look underdone – let sit 20 minutes and they will firm up. Muffins last for 3-4 days refrigerated or 2-3 weeks frozen. Are you looking for a kid-friendly or even spouse-friendly healthy food option that everyone can enjoy? Then look no further! These pretzel crusted chicken bites are the perfect appetizer, snack, or main course. Serve them up with a side of baked sweet potato fries and you have an easy, crowd-pleasing meal even the pickiest of eaters are sure to love. You don't even have to tell them the chicken bites are baked. The crunch on the outside, tender chicken on the inside, and great flavor could fool anyone. I like mine with ketchup and Greg prefers honey mustard or BBQ sauce. It felt like we were eating a "bad" meal, but in reality, it was pretty healthy. Next time we're going to try using gluten free flour and pretzels, so I'll update you on how they turn out once I do. You can serve these little guys as an appetizer with toothpicks or have as your main dish. Either way, everyone will love them! 1. Preheat oven to 400°F (204°C). Line a large baking sheet with a silicone baking mat or coat heavily with nonstick spray. 2. If using chicken breasts, pound down and cut into little 1-1.5 inch pieces. If using boneless, skinless chicken tenders simply cut into 1-1.5 inch pieces. 3. Combine flour, salt, and pepper in a shallow dish. Beat eggs in another shallow dish. Pour pretzels into a third shallow dish. Coat each chicken piece in flour, shaking off any excess. Then, dip in egg and let any excess drip off. Then generously roll in the pretzels, shaking off any excess. Add more crushed pretzels to the dish if you are running low. Place the chicken bites on the prepared baking sheet. 4. Bake for 8 minutes. Turn each piece over and continue baking until the outside is crisp and the centers are cooked through, about 6-8 minutes more. Baking times may vary, just make sure yours are cooked through. If you like them more brown, bake longer. Serve chicken bites with toothpicks (if using as an appetizer), honey mustard, or cheese sauce. Store any leftovers in the refrigerator for up to 2 days. I have been craving curry and coconut flavors lately. It might be because our wedding venue is Polynesian, so those flavors are always on my mind? Not sure. Whatever the reason, I spotted the Thai Green Curry simmer sauce at Trader Joe's the other day and I had to buy it. This dish is very easy to make and can be easily altered to taste. The sauce is pretty mild, so even skeptics will enjoy a new menu item for dinner. Serve with brown rice, quinoa, and sub out chicken for tofu if you're a vegetarian. 1. Cube chicken breasts and saute in coconut oil on medium high until cooked through. Set chicken aside and cover. 2. Add diced red bell peppers and onions to pan using juice and oil from pan. Cook until onions are soft and translucent. 3. Add chicken back to pan. Pour about 1/2 cup of sauce and stir to coat chicken and veggies. 4. Add about a handful of fresh spinach and stir until leaves are wilted. Add more sauce if necessary or to taste. 5. Serve immediately over rice or quinoa. This makes delicious leftovers, too! Even though I love my grandma's recipe, it's starting to be strawberry time in San Diego, so I was inspired to try something new. 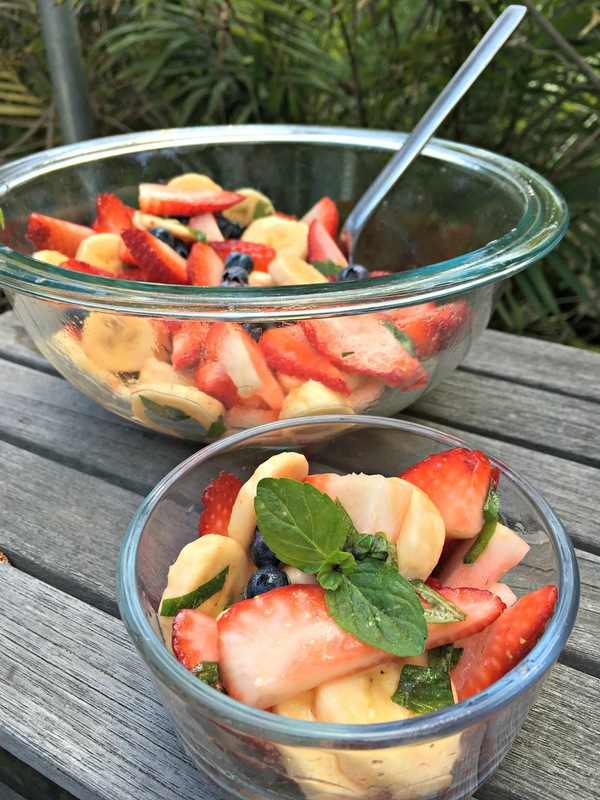 This Honey Lime + Mint Fruit Salad kicks up a regular old fruit salad a notch with a zesty citrus honey flavor and fresh mint aftertaste. You can use whatever fruit you prefer, but I think strawberries are a must in this one. 1. Chop up all fruit and mint and toss together in a medium to large bowl. 2. Juice limes until you have 2 Tbsp of juice, then mix with 1 Tbsp honey or agave. 3. Pour juice over fruit and mix to coat. 4. Eat right away or store in an airtight container in the fridge for up to 3 days. Enjoy your bowl full of sunshine! Fri-yay!! Celebrate with this fabulous homemade peanut butter cup recipe! This yummy, gluten free treat will satisfy your sweet tooth with mostly wholesome ingredients and low calories. You probably have the ingredients on hand too. Chocolate chips melted with a little almond milk create the base and top while peanut butter mixed with a banana and a 1/2 tsp of vanilla extract make up the rich filling. 1. Line 6 muffin cups in a muffin tin with paper or foil muffin liners. Spray liners with cooking spray. 3. Pour 1 Tbsp melted chocolate into each liner, coating bottom. 4. Place in freezer for 10 minutes. Meanwhile, mash banana, peanut butter, and vanilla until creamy and smooth. 5. Remove muffin tin from freezer and drop about 1-2 Tsbp peanut butter mixture into each cup and spread evenly. 6. Top each cup with remaining chocolate and smooth over banana mixture gently to edge. 7. Freeze for 3 hours and enjoy. Could be made vegan if using vegan chocolate chips. These are very easy and you probably already have all the ingredients on hand. Never heard of PB2? Well, I'm about to change your life. Here's a post I did on it a couple of years ago. These brownies are super moist, surprisingly cakey, and very rich and chocolatey just like a "regular" brownie. You really wouldn't know they're flourless. I have a couple of other healthy brownie options like these gluten free chocolate avocado brownies and these vegan chocolate raspberry brownies. Which is your favorite? 1. Preheat the oven to 325°F. Spray a nonstick 9 x 9 inch baking pan with cooking spray. 2. Beat the egg and egg white in a small bowl with a whisk. 3. In a large bowl combine the PB2, cocoa powder, salt, baking soda and mix well with a spatula. Add the egg and egg whites and stir. Add water, honey, vanilla and stir with a spatula until combined. Fold in the chocolate chips. 4. Pour the mixture into the prepared baking pan and bake about 30 minutes or until a toothpick inserted in the middle comes out mostly clean. Set aside to cool, then cut into 12 bars cutting 3 rows x 4 rows. Store in an airtight container or share. You know that person who has tuna salad at work and stinks up the whole office? Tuna is one of the best power foods you can eat. One can is about 140 calories and 30g of lean protein. Plus, when you mix in healthy foods like avocado, tomatoes, onion, or Greek yogurt, you up the healthy factor even more. Anything with mayo is generally a no-no in my book. It is one of those zero nutrient foods. A ton of fat and calories for a tiny portion. 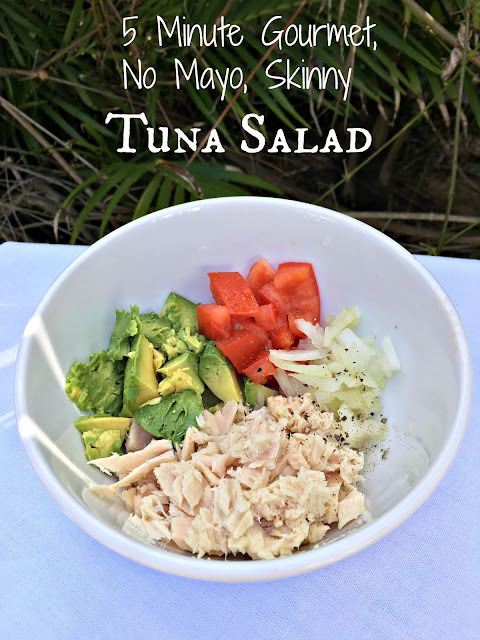 Here's the tuna salad I threw together with what I had in my fridge the other day. It was so delish! It was fresh, light, and very satisfying and with the creamy avocado I really didn't miss the mayo. Oftentimes I'll mix it with Greek yogurt and mustard, which is how Greg prefers his. He'll also make a tuna melt by topping his tuna sandwich with cheese a placing it under the broiler. You can also make this ahead of time and keep it in the fridge to eat later; perfect for a make ahead lunch. Mash together all ingredients and eat plain or on a sandwich. I've been engaged for two months and we are almost done with the wedding planning! The last big thing is finding a DJ. Everything else is little or done! It's such a relief. I'm so not a wedding planner and I didn't dream about my wedding from the age of 5. I didn't even know where to start, but I am one of those to-do list types who wants to check all the items off ASAP. Now that wedding planning has wound down a bit and it's actually staying lighter in the evenings, I've been able to get back to my cooking and picture taking. I'm always trying to reinvent new chicken and turkey recipes because they can get old pretty fast. (Greg definitely agrees). 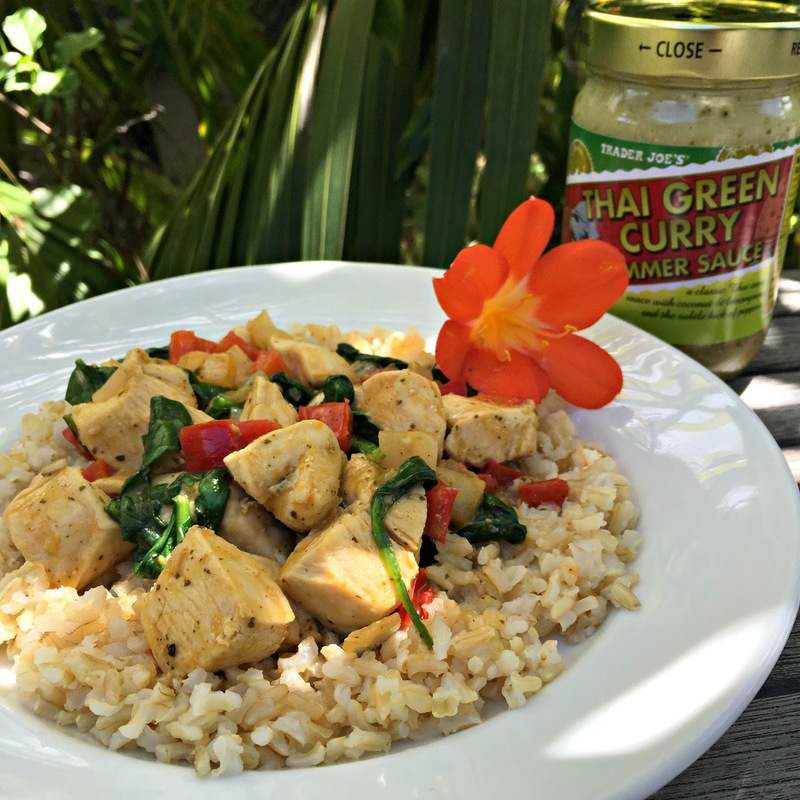 If you're a fan of tangy sauces, you will LOVE this recipe. It's got fresh zesty lime juice, but it's balanced out with cream and butter and I really just wanted to lick the pan. 2. Sprinkle chicken breasts with salt and pepper while heating a large oven-safe skillet* on medium high heat with the olive oil. 3. Add the chicken and cook for 6-7 minutes, turning halfway. The chicken should be browned on both sides evenly and mostly cooked through, but not completely. Set chicken on a plate and cover tightly. 4. Remove skillet from heat and add broth, lime juice, onion, cilantro, and red pepper flakes. Return to heat. Cook and scrape up browned bits from bottom of pan. Bring to a boil and let reduce for about 10 minutes or until liquid is reduced to about 1/3 cup. (I steamed some asparagus during this point to go on the side). Reduce heat to medium-low, then add the cream and butter. Stir until the butter is melted. 5. Add the chicken to the sauce and place skillet in pre-heated oven. Bake until chicken is completely cooked through, about 5-10 minutes. 6. Serve chicken with sauce spooned over the top. Leftovers can be refrigerated and reheated. *I don't have an oven-safe skillet, so I transferred my chicken and sauce to a baking dish before popping in the oven. For a one dish meal, an oven-safe skillet would be easiest. Saturday mornings are my favorite. I'm always in such a good mood. I get to sleep in, actually take my time drinking coffee, leisurely read the news and the best part... make a yummy breakfast. We picked up a bunch of blueberries at Costco, so blueberry pancakes were the logical choice yesterday morning. These are a deviation on my Pumpkin Chocolate Chip Pancakes. Instead of pumpkin, I added more Greek yogurt and obviously subbed out the chocolate chips with blueberries. These pack a protein punch and keep you full for hours. They also have no added sugar. I topped mine with pure maple syrup, which is a natural sugar, but you could use a blueberry compote, jam, nut butter, or whatever you prefer. The blueberries burst while cooking and so they added to the moistness of the pancakes. Even though these are made completely of oats, they are still fluffy and flavorful. In fact, I like them better because they don't weigh you down with all of that flour that sticks to your tummy like glue. 1. In a small bowl, mix together the wet ingredients until very well combined. 2. A whisk works well for breaking up the yogurt clumps. 3. In another bowl (very important to separate wet and dry ingredients for this recipe), toss together all of the dry ingredients except blueberries and stir until well combined. 4. To make oat flour, place regular old fashioned oats or quick oats in a blender or food processor and pulse until they resemble flour. Make sure they aren't chunky and really resemble a flour. Measure after blending and not before. 5. Combine wet and dry and stir until just combined. Over-mixing the batter yields denser pancakes. 6. Grease a griddle or large nonstick skillet with nonstick spray (I use a coconut oil based spray) and heat the griddle to medium-low heat. 8. Place on a plate, cover with maple syrup or peanut butter (or whatever toppings you like on your pancakes) and enjoy immediately. 9. To keep the pancakes warm while the others are cooking, you can place them separately on a large cooling rack (stacking makes them soggy) in a 200-degree oven UNCOVERED for up to 20 minutes - after that they start to dry out. I am a sucker for anything with peanut butter and chocolate. I think that's my favorite food group. But with peanut butter already having a high calorie content, I try to eat it in moderation. I created this recipe the other day to have a healthified peanut butter chocolate chip cookie I could eat a few of without feeling guilty. They were all I could've hoped for. Chewy, peanut buttery, rich and chocolatey. With no flour, butter, or oil! Perfect for any of you gluten free readers out there. And Greg loved them because he's a big fan of oatmeal chocolate chip cookies, so they were just a variation on those. And don't worry, you don't even notice the missing flour or butter. 2. In small bowl mix together the oats and baking soda; set aside. 3. In a large bowl beat peanut butter, brown sugar, eggs and vanilla with an electric mixer until smooth, about 3 minutes. Mix in dry ingredients with a spatula, then gently fold in chocolate chips. 4. Roll cookies into 2 inch dough balls and place onto cookie sheet 2 inches apart, then BARELY flatten the top of the cookie with your hand. Or just use a cookie scoop and flatten a bit. 5. Bake cookies for 9-11 minutes and remove when edges barely begin to turn a golden brown. The cookies may look a little underdone, but they will continue to cook once you remove them from the oven. Cool for 2 minutes on the cookie sheet then transfer to a wire rack to cool completely. Repeat with remaining cookie dough. Makes 16-20 cookies. Adapted from here. *Natural peanut butter is much more runny in consistency and will likely result in a very flat cookie that spreads. If you try it, let me know. 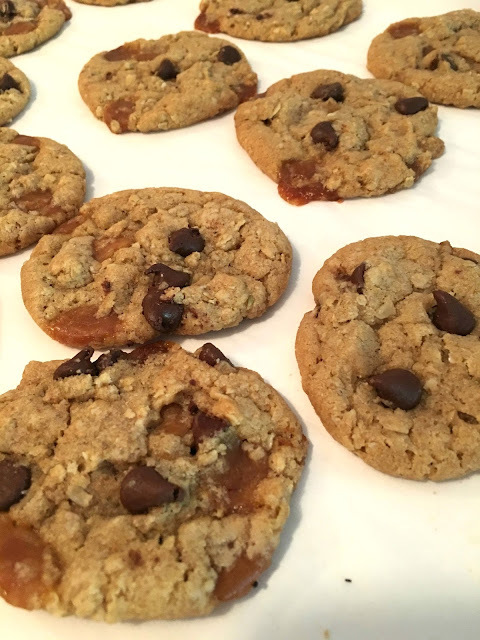 **Quick oats may be too thin to give the cookies much shape. If you use them, you may need to add more oats. For those of you who know what that is, enough said. For those of you who don't... O.M.G. you must buy it immediately!! Trader Joe's has become infamous for their version, but there is also the Biscoff brand you can buy at many grocers and I've even seen it at World Market. This stuff is life changing. I try not to keep it in my house because I can't keep my hands out of the cookie jar. (Sorry, I couldn't resist). But seriously, you don't know what you're missing if you haven't tried it. The problem is, it's kind of hard to know how to eat it. I opt for straight out of the jar which is all good and fun, but sometimes I'm feeling a little more creative. What goes well with heavenly cinnamony spread? Thus, Cookie Butter Banana Bread. 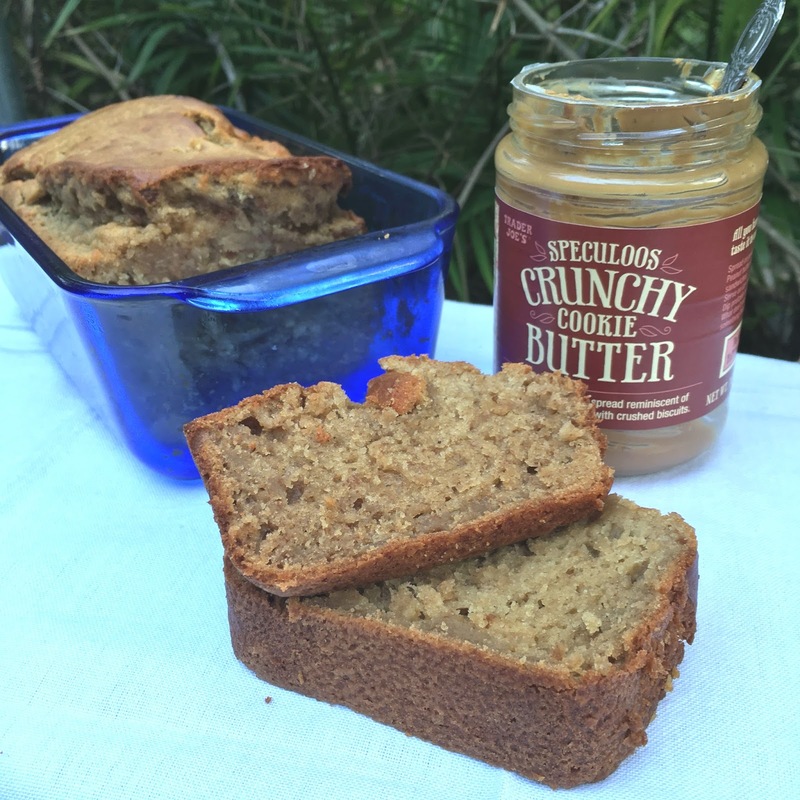 A basic banana bread taken up a notch with the addition of 1/2 cup of cookie butter. Oh yes. 1. Preheat oven to 350°. Spray your loaf pan with cooking spray. 2. Cream oil, cookie butter, greek yogurt, and sugar in the bowl of an electric mixer (and hand mixer is okay too). 3. Add the bananas, eggs, sour milk, and baking soda to a blender. Mix until liquefied. 4. Pour half of the banana mixture into the butter mixture with 1 cup of flour and the salt and mix until just combined. Repeat with the rest of the liquid and flour. Do not overmix! Optional: Pour white or dark chocolate chips in mixing bowl before pouring into loaf pan. Gently fold into bread mixture. Greg's Homestyle Chunky Chicken Noodle Soup + Big News! 1. Place chicken and water in a large pot over high heat and bring to a boil. Reduce heat, cover and simmer, skimming fat as needed, 30 minutes. 2. Place the halved onion, bay leaves, peppercorns, whole celery, whole carrots in the pot and simmer, covered 1 hour. 3. Strain broth and reserve chicken. When chicken is cool enough to handle, remove skin and shred into bite-size pieces. 4. Return strained stock to pot over high heat, and stir in chicken bouillon, chopped celery, mushrooms and chopped carrots. Bring to a boil, then reduce heat, cover and simmer 20 minutes, or until carrots are tender. 5. Add in noodles. Simmer until noodles are cooked, about 10 minutes more. Stir in chicken and heat through. How did you spend your holidays?